I’m a sucker for economics/financial books like Michael Lewis’ non-fiction Flash Boys or in fiction, Michael Sears. 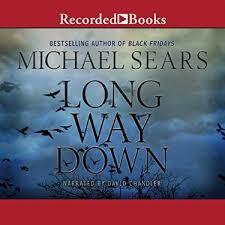 Long Way Down is the third and most recent in his Jason Stafford series and it’s soooo satisfying. The first-person Stafford is an ex-con, convicted of stock market finagling as a trader, he served several years behind bars but has reinvented himself as a fraud investigator for big financial concerns. As such he works both sides – for the companies and for law enforcement and he’s trusted by both. Meanwhile Stafford has a 6-year old son who has a significant degree of autism and a girlfriend who is a well educated fitness expert. “The Kid’s” mother is deceased. This personal life is fascinating to me going way beyond the usual cop with a difficult ex-wife and a drinking problem. Anyway – in Long Way Down multimillionaire Philip Haley, whose company has made and is making more break-throughs in bio-energy products, has been accused of insider trading. The financial firm Haley deals with hires Stafford to help. Haley says someone set him up and Stafford believes him – but who could that be? Haley suspects the Chinese but … there are other possibilities. Stafford works with old friends and knowledgeable people – techie stuff is explained, but with respect for the reader’s knowledge and intelligence and some interesting tidbits of new-to-me information. Haley came from a middle class background and is now a multi-millionaire from his own engineering developments. His passion is his work and ocean life, fishing. His wife, Selena Haley, is the only heir to a billion-dollar coal mining fortune, they have no children. Other members of the board of directors at Haley’s firm include two really rich and arrogant members who might have motive to see Haley in trouble. The characters are interesting, especially Benjamin McKenna, a very odd duck and just as hard to find. A professional computer genius and hacker he has access to university computers but is also followed by groups of FBI folks. Paranoid to the max but with reasonable cause. Sears’ narrative is very nicely sprinkled with a dry humor and I found myself chuckling out loud. and Chandler reads the series well. The one thing which irritates me about the Stafford series is the chase scenes – I’m just not fond of that sort of thing and a little bit goes a long way – Sears likes chase scenes way more than I do.